John Ridley, winner of Best Adapted Screenplay for 12 Years a Slave, attends the Governor’s Ball after the 86th Academy Awards on March 2, 2014, in Hollywood, Calif.
John Ridley is keeping the ball rolling with his career and is not letting that Academy Award he won for writing the screenplay for 12 Years a Slave make him complacent. According to the Hollywood Reporter, Ridley will be directing a movie about the Rodney King beating that was caught on tape and the Los Angeles riots that followed after the police officers who beat King were exonerated. The movie's producers weighed in on why they thought Ridley was the perfect guy for the job. "This is a seminal event in our country's history, the reverberations of which are still far too relevant today. We were blown away by John's amazing screenplay and we know that under his direction and the aegis of Imagine, the film will be truly incredible," producers Gabriel and Daniel Hammond said in a statement. Another producer, Brian Grazer, is also excited about collaborating with Ridley. 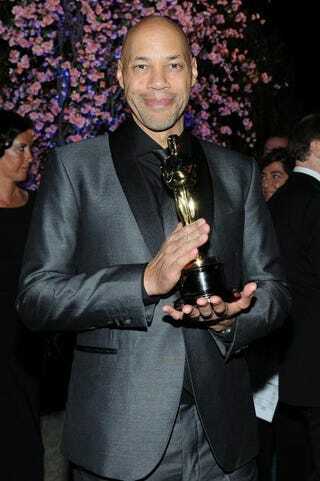 "We have barely seen the tip of the iceberg in terms of John Ridley's talent. I am confident that he will capture the magnitude of the events that unfolded and the issues that led up to them. He will show the world why the riots cannot and should not be forgotten," Grazer said. Big ups to Ridley for getting this gig. It seems to follow along the lines of the Straight Outta Compton N.W.A biopic from this past summer. I think it'll do just as well.